Your New Place to Call Home! Find your escape at Jameson’s Cove in southern Cary with only 13 homesites starting from the $600s. Jameson’s Cove offers residents the ultimate location with easy access to greenways, shopping, dining, Downtown Raleigh and Research Triangle Park. Camp Branch Greenway trail access is located within the community which provides entry to the 70 miles of greenway trails and thirty parks and natural areas managed by the Town of Cary. Shopping and dining are available within a short ten minute drive and commuting to Research Triangle Park or Downtown Raleigh is an easy twenty-five minute drive. 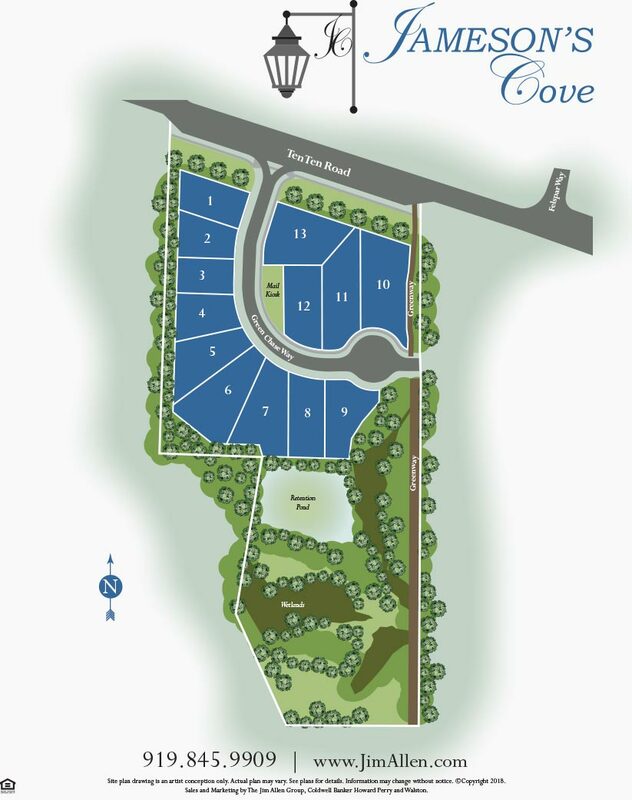 Perhaps most importantly, a homesite in Jameson’s Cove offers you the opportunity to create your custom home experience built around the way you live. The Jameson’s Cove builder team brings tremendous experience, thoughtful planning and homeplans tailored to meet your needs. Start Building the Home of Your Dreams! From I-440 Beltline in Raleigh, Take US-1 S Take exit 96/Ten Ten Road in Cary. Travel about 3 miles and Jameson’s Cove is ahead on the left.